Brolgas (‘Native Companion’) and their eggs were important food items for indigenous hunter-gatherer societies, and hunting and egg collection continue in northern Australia today. Also in the north, Sea-Eagles, crocodiles, dingoes, pythons and goannas (large varanid lizards) still abound in breeding and other wetlands. In southern Australia feral animals are believed to be the main predators of Brolgas, especially chicks and immatures, but there are no studies quantifying impacts. 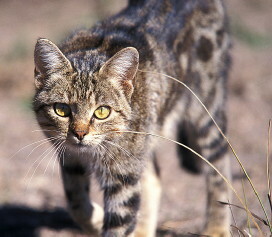 Feral animals may also affect wetland condition and availability of diet items. There have been no studies to assess the levels or potential impacts if any, of predation and wetland degradation on northern Brolgas or the much rarer Australian Sarus Crane. Illegal harvesting for the taxidermy trade is another form of hunting. In March 2017 a Northern Territory taxidermist was convicted of 365 offences after a raid by wildlife officers found 1,300 animal parts, and 400 individual animals of 91 species, mostly protected. The haul was estimated to be worth $AU500,000 on the national and international black market, and is believed to be the biggest seizure of illegal wildlife in Australia. Brolgas were among the specimens seized, image of dead Brolga and story at ABC Northern Territory. The sentence was 10 months suspended from a possible maxiumum of 5 years, and NT Wildlife is considering an appeal against the sentence. The judge's remarks included: There is "no evidence to prove that any of the species in Mr Eswaran's possession were endangered in the NT", and saw his behaviour as no different from "naturalists 100 years ago". There are no feral predators in northern Australia but risk assessments list Brolgas as potentially affected by the westwards spread of poisonous cane toads to the Kimberley Region. Cane toads have been present in north Queensland crane habitats since the 1930s with no known impacts, but there are no studies. There is an anecdotal report of a Brolga killed by eating cane toad tadpoles; but another report of a Brolga not affected by eating an adult toad. 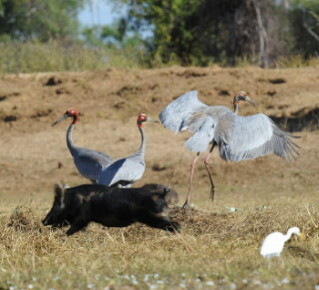 Feral animals and habitat Feral pigs are common and widespread in all northern Australian crane habitat. 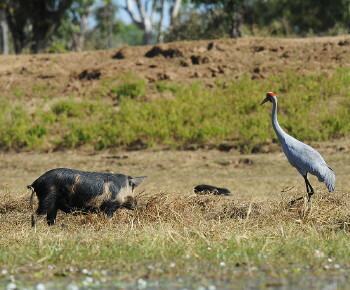 Pigs are associated with widespread wetland damage and feed heavily on a favoured food plant for northern Brolgas and Sarus Cranes, Bulkuru Sedge Eleocharis dulcis. They also prey upon eggs. But again, none of these impacts on cranes has been quantified or assessed and some observers report pig activity in wetlands helping to spread Bulkuru Sedge (see Ozcranes Brolga FAQ 3»). Wetland damage by feral pigs was studied in north tropical Queensland, including the effects of fencing, or not fencing, wetlands. For more on risks of wetland fencing for cranes, see Ozcranes Fencing pages». A possible future threat? Present in Australia for some 4,000-10,000 years, Dingoes (Canis lupus dingo) are an important apex predator. Any impacts of their arrival and spread on Brolgas (present in Australia about 2 mill years) and Sarus Cranes (present some 30,000 years) would have stabilised long ago. But dingoes are threatened by interbreeding with domestic dogs Canis familiaris, any impacts this might have on crane populations is unknown. 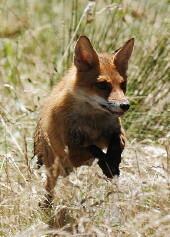 Fox-baiting programs are undertaken in SE Australia but studies by Matthew Herring and the Arthur Rylah Institute suggest wetland redesign and management may be more effective to increase nest success, for example water levels at about 30cm increase parental awareness of predator approach. Articles on Brolga wetlands for farms, resulting from Matthew's research, are available for download in Ozcranes Downloads». 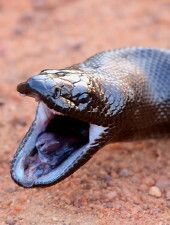 Extensive information on research and programs to control invasive animals in Australia can be found at the Invasive Animals CRC. 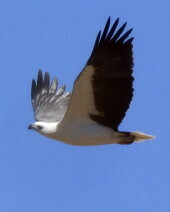 Sea-Eagle av. 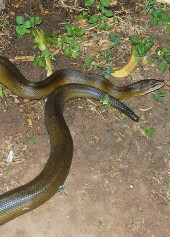 length is 80cm, with wingspan to 2 metres. They can take prey the size of a swan. 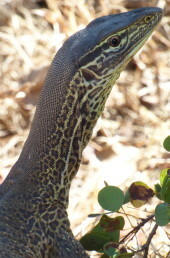 ↑ Yellow-spotted Monitor, Gulf of Carpentaria (K.S. Gopi Sundar). A robust predator to 1.4m, found in northern Brolga and Sarus Crane habitats. 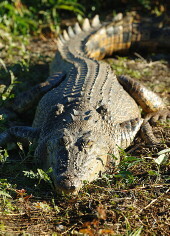 It forages on land or in water and known foods include turtle and crocodile eggs and sometimes small birds.